The 2018 Chevrolet Equinox is a compelling compact crossover SUV alternative to the class-leading Honda CR-V, Toyota RAV4 and Mazda CX-5. Smaller than its predecessor, the new Equinox sacrifices almost nothing in terms of interior space. With a standard 1.5-liter turbocharged 4-cylinder, it's easily competitive in its market, but having the option of a powerful 2.0-liter turbocharged 4-cylinder or a 1.6-liter diesel with great highway fuel efficiency makes it even more attractive. but we're excited for power of the just-released 2.0-liter turbocharged 4-cylinder and the fuel efficiency of a 1.6-liter diesel. Handles like a midsize car even though it looks like a sports utility vehicle (SUV). I am only a passenger - I like that I can raise or lower my seat. The lighted vanity mirror is really handy. I love the blindspot assist in the mirror and the back up camera. Having OnStar is a great crutch, especially since we are older driver & passenger. I dislike the lack of a "sunshade" for the all important touch screen. Our previous Equinox (2010) had everything just right for us. We traded it in order to get the more advanced safety features. This new one has the cargo door release on the driver's door so the passenger can't assist the person trying to open it. The second row seat is stationary. When our grandchildren rode with us I could barely reach them from the front seat. The rearview mirror is a manual day/night switch. There is no longer a navigation program - you must have a smartphone in order to transfer your driving map or contact OnStar and ask for their navigation to be sent to your car. There are enough issues that we decided within the first 60 days we would trade it much sooner than any of our other vehicles. It is very reliable and our local dealership is great. 2018 emerald Equinox feat. -4g Wi-Fi & OnStar. + USB. All in all-a great vehicle. The 2018 Equinox drives perfectly in all weather. The seating in very comfortable in the front 2 seats, that can be heated and the 3 seat in back has a middle section that pulls down to a cup holder for 2 and table. The trunk area is roomy and has hidden compartments for storage. There many USB charging area throughout the vehicle. The sunroof opens up from the front to the beginning of trunk area. The roof opens up in the front only. The vehicle is loaded with 4g Wi-Fi (with activation) OnStar is allowed loaded (with activation) both came with a 6 mo. Free service when vehicle was bought. This vehicle is a one-of-a-kind color, emerald green. In my state only 2 were shipped here in 8/2017. Vehicle also has an auto engine stop when car in idling. Very safe, reliable, comfortable, useful SUV I have ever owned. 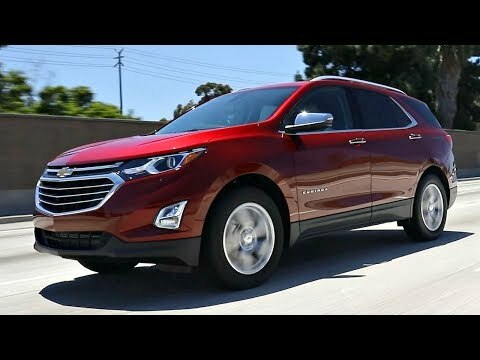 2018 Chevy Equinox many safety features. The only problem I have is that the battery can run down if you do not unplug something in the rear auxiliary socket. I love the push button start and the way you can lock and unlock the doors by pushing a button on the driver side outside door. It also has a great backup camera with a warning if something is coming from either direction. Also on the outside mirrors there is a warning light if there is a car in your blind spot which really helps when trying to pass on interstate highways. I also like that there is no gas cap to take on and off. The radio is great but there is no CD player anymore but you can play music off your phone through the radio. I am getting better gas mileage than on any other Equinox that I have owned. Also the four wheel drive can be engaged at any time.